This article contains facts and information about the life and times of the famous Native American Indian chief known as Osceola. Who was Osceola and why was this Native Indian chief famous? 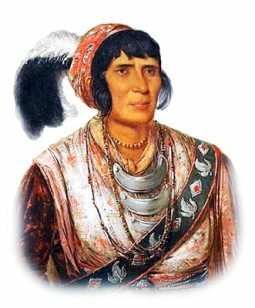 Summary: Oseola (1804 - 1838) was a famous leader of the Seminole tribe, a branch of the Creek tribe, who were based in Florida. He led the Seminole resistance against efforts to remove them from Florida to Indian Territory in Oklahoma. Osceola was imprisoned by General Joseph Hernandez. Mystery surrounded his death on January 31, 1838. Osceola is said to have died either by an attack of quinsy, by his own will or was poisoned. The following fact sheet contains interesting facts, background history and information about the life of Osceola and the events in history that led to his fame as a great Native American Indian leader. Many members of the Creek tribe were displaced from Alabama during the 1700s and had moved to Florida. Over time these people formed their own tribe that became known as the Seminole. The Seminole (their name means "separatist") separated from the Creek tribe in the early 1700's and settled in the former territory of the Apalachee in Florida where they were joined by black runaway slaves. The Seminoles were one of the Five Civilized Tribes were nations of Native American Indians who had assimilated cultural lifestyles and customs of the white colonists and settlers. The Seminole Native Americans were under Spanish rule but became involved in several major conflicts with the United States. The conflicts including the War of 1812 and other conflicts between 1817 and 1818. General Andrew Jackson retaliated and invaded Florida with more than 3,000 men to punish the Seminole tribe. The 1830 Indian Removal Act was passed, treaties were broken and in 1835 the Seminoles led by Chief Osceola participated in the Seminole Wars. The following Osceola timeline charts the life of this famous Seminole chief and his fight to prevent the Seminole Native Indians move to a reservation. For additional facts and information refer to the legend and the Story of Osceola. Discover the vast selection of pictures on the subject of the tribes of Famous Native Americans such as Osceola. The pictures show the clothing, war paint, weapons and decorations of various Native Indian tribes, such as the Seminole tribe of Osceola, that can be used as a really useful educational resource for kids and children of all ages studying famous Native Americans such as Osceola. We hope you enjoy watching the video - just click and play - a great educational resource for kids.